USB Type-C has been around for a while now, and most, if not all, Android flagship smartphones these days sport the modern USB port. However, most of them come with chargers that still have the Type-A (or as you probably know it, the “regular”/ “big” USB port). That means you use a Type-A to Type-C cable, so you won’t need any extra cables if you are in the market for a power bank. On the other hand, if you have a phone — like the Google Pixel series — that ships with a Type-C charger and a cable that’s Type-C at both ends, or if you are someone who is trying to go all-in with the Type-C lifestyle, your choices in terms of accessories — and especially power banks — can be pretty limited. Most power banks out there have regular Type-A USB ports for output and a Micro-USB port to charge the power bank itself, which means you will need to carry around two extra cables just to make the power bank work for you. Then there are others — such as the Mi Power Bank Pro — that feature a Type-C port, but it is only to charge the power bank itself, and it cannot be used for output. Finding a power bank with Type-C output in India was a surprisingly difficult task, but we managed to find three different models. We then proceeded to use these in the real world over a few weeks as well as run them through a standard set of tests in our labs. We wanted to test the power banks on two factors — if they live up to their rated capacities, and the speed at which they charge. The first test involved charging a series of fully drained smartphones (all with batteries that were at full health, meaning at or near their own rated capacities), and then seeing whether or not each power bank was able to charge as many smartphones as the rated capacity would indicate. The phones that we used all have relatively large batteries — the Xiaomi Mi Mix 2 (3400mAh), iPhone XS Max (3174mAh), Samsung Galaxy Note 8 (3300mAh), and Google Pixel 2 XL (3520mAh). The second set of tests was designed to measure the amount of time it took to charge each smartphone. We first observed how much a phone could be topped up in thirty minutes, and then checked the time each power bank took to fully charge each smartphone. Note that we restricted ourselves to charging the phones and the power banks themselves using their Type-C ports, since that’s the focus here. So power banks that do not support some kind of fast charging with their Type-C ports did not fare as well as they would if we had been using their Type-A ports. We also used the same cable to charge phones across different power banks, and put the phones in flight mode to eliminate any variables. Note that all of the power banks we tested support features like the ability to charge multiple devices at once, auto power off when you remove the cable, and automatically charging a device when you plug in a cable. Also note that nearly all power banks advertise their battery capacities at 3.7V, while USB devices typically draw 5V, so the output capacity of the power banks for end-use is actually lower. 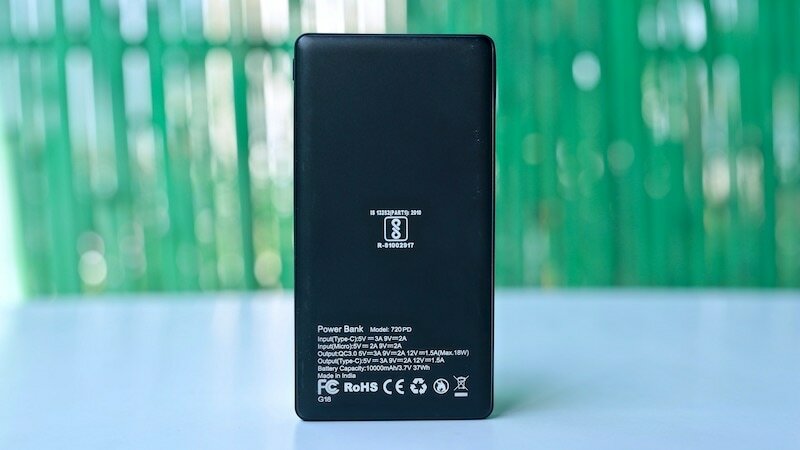 In other words, a typical 10000mAh power bank will have an output capacity of around 7000mAh, though the exact value varies from one manufacturer to another, and is often buried in the products’ detailed specifications. This means that though your power bank is advertised a “10000mAh power bank”, it will have just about enough juice to charge a 3500mAh smartphone twice over, not accounting for normal electrical losses resulting from the various circuits involved. With that out of the way, here’s everything that we learnt from testing these Type-C power banks. 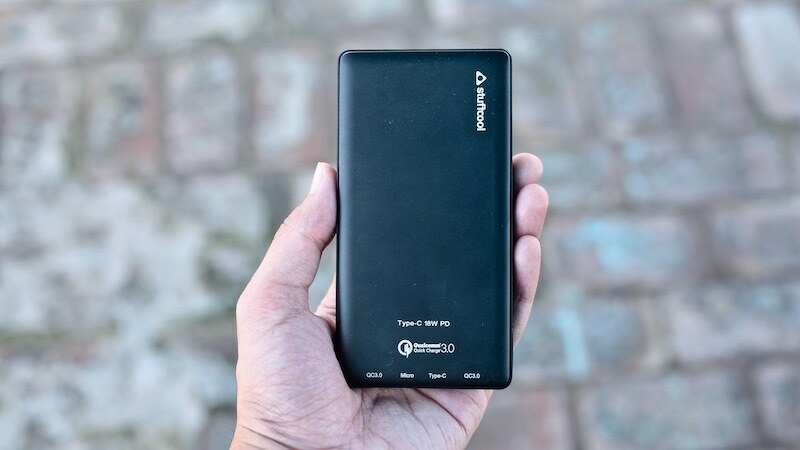 The most versatile power bank that we tested, this one comes from Stuffcool, an Indian company that’s made its name selling phone accessories over the years. 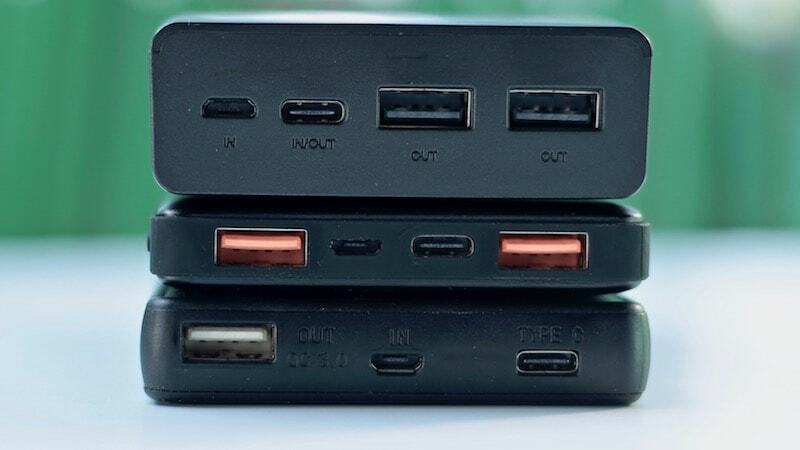 You get two full-sized Quick Charge 3.0 Type-A USB ports, one Type-C port (with fast charging and 18W USB-PD) that can be used for both input and output, and one Micro-USB port, which can obviously only be used for charging the power bank itself. The Stuffcool 720PD was the fastest power bank we tested in terms of both charging smartphones as well as getting charged itself. It was able to take a completely drained Xiaomi Mi Mix 2 to 45 percent in just 30 minutes, fully charging the phone in a little over 90 minutes. Then, it took a drained iPhone XS Max to 40 percent in 30 minutes, with the phone charging fully in a little over 2 hours. The power bank then had just enough power left to juice up a Samsung Galaxy Note 8 to 8 percent. All this was in line with its rated capacity of 6800mAh, which is lower than the other two power banks. That might seem disappointing, but the speed at which it charged all devices could make up for that depending on your priorities, and we certainly don’t mind trading off a little bit of capacity for fast charging on the move. The Stuffcool power bank is unsurprisingly the lightest and most compact in the group, and its build quality and overall feel are really premium. There are four LEDs that light up in white to indicate the current charge level of the power bank and also if it’s charging/ discharging. Another LED lights up in blue when Quick Charging is being used to charge a device or the power bank itself, or if your are in USB Power Delivery mode. The latter happened when we used this power bank to power our 13-inch MacBook Pro — skip to the end to read more about that. This is also the only power bank of the three we tested that supports fast charging over Type-C for input as well, and we were able to fully charge it bank from empty in a little over three hours, which is as good as it gets. While Stuffcool is an established name in the accessories space, Lcare is a relatively new Indian brand that’s trying to make a mark in this segment. 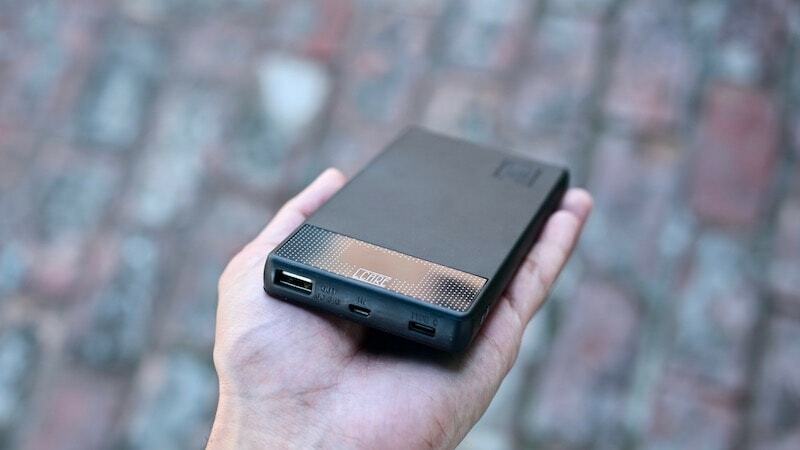 We were really impressed by this compact power bank, which is only a little bit larger than Stuffcool’s offering, though it makes up for that by offering a slightly higher output capacity as well. Note that the specifications that we have listed here are of the unit that we got, and the model listed on the Lcare website right now seems to have a lower rated output, so be sure to check with the company before you place your order. In our battery capacity test, our unit was able to fully charge the Galaxy Note 8 and the Mi Mix 2, and then even managed to charge the iPhone XS Max to 43 percent, more than living up to our expectations. However, with no fast charging support on the Type-C port — the full-sized Type-A port is Quick Charge 3.0 compliant — this power bank was consistently slower than Stuffcool’s option when charging our phones, taking a full two hours and ten minutes to fully charge the Mi Mix 2, for example. Our favourite feature is the useful display that shows the amount of power left in the power bank, and even indicates the rate at which your phone is being charged. Our only complaint with it is that the display is a bit too faint, and we had to really strain ourselves to see it at times. With no fast charging over Type-C, it took us nearly six hours to charge the power bank over Type-C. You should be able to do it quicker using the Micro-USB port paired with a Quick Charger. 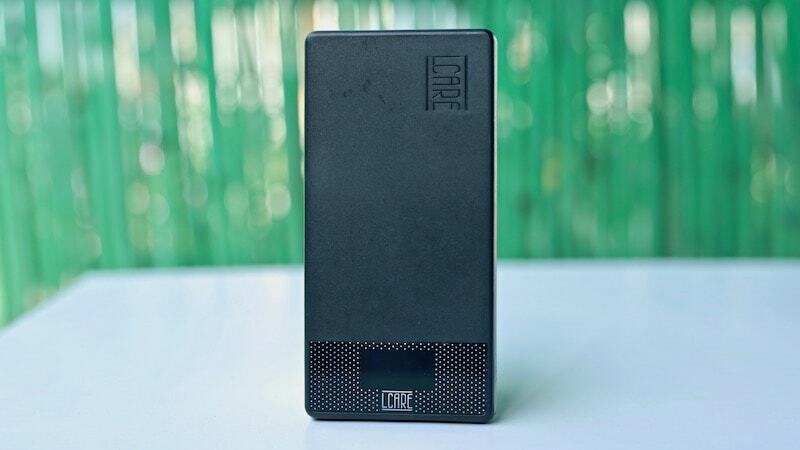 Lcare also sells a Type-C power bank without the display at Rs. 1,095, which is even better bang for your buck, if you can live with just an LED indicator. iVoomi is a Chinese OEM/ ODM that entered India in March 2017 and has launched a host of budget smartphones in the market since then. The company sent us a 15000mAh Type-C power bank for testing, which makes it the highest capacity offering that we tested. Obviously, that makes it the bulkiest power bank of the three, but, sadly, it also feels the cheapest in terms of build quality. What’s more, the front of the power bank has a pattern that lights up in different colours — green, blue, and red — when the power bank is being used, to indicate the current level of charge. While a good idea in theory, we found this implementation to be rather garish, and we would have preferred something a bit more subtle like standard LEDs. 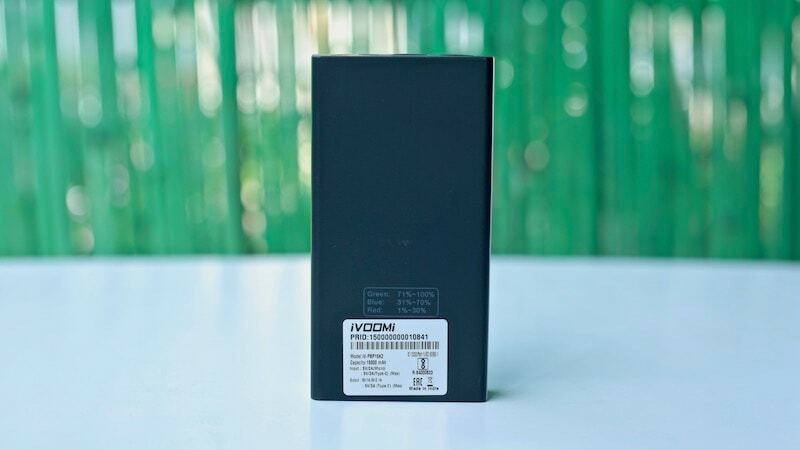 While iVoomi doesn’t state the rated output capacity of the power bank, we were able to fully charge our Mi Mix 2, Galaxy Note 8, and iPhone XS Max, and still had enough juice left over to charge a Pixel 2 XL up to 42 percent. That roughly indicates a capacity of a little over 11000mAh. In terms of charging smartphones over USB Type-C, the iVoomi power bank was a little faster than the Lcare, but still slower than the Stuffcool power bank. However, in the absence of Quick Charging over Type-A, your experience using this power bank will be worse than what you’d get with the Lcare unit while topping up compatible smartphones. Thanks to its high capacity and the lack of fast charging for input, you will really have to leave this power bank plugged in overnight when you are topping it up. Can I use these power banks to charge my MacBook Pro? Apple’s new MacBook Pro models use the Type-C port for charging, so it’s logical to ask if you can use Type-C power banks for charging your laptop. If you have the 15-inch MacBook Pro, you can forget about trying to use it with any of these power banks, as it draws too much power. If you have the smaller MacBook Pro or the 12-inch MacBook, you might have better luck. The Stuffcool power bank is the only one that officially supports USB Power Delivery, which makes it your best bet (out of the three) if you want to use your power bank to top up your laptop. We plugged a 13-inch MacBook Pro in to the Stuffcool power bank, and even while running some resource-intensive browser-based benchmarks, it slowly but surely topped up the laptop (4 percent in 15 minutes). Then, we stopped the benchmarks and left the machine idle with just the display on, and the charging was, as expected, much faster (7 percent in 15 minutes). Note that the 13-inch MacBook Pro ships with a 61W charger, and the Stuffcool power bank supports 18W Power Delivery, so the results aren’t surprising. The 12-inch MacBook ships with a 30W charger, so your experience using the laptop while plugged into the power bank should be a lot better. 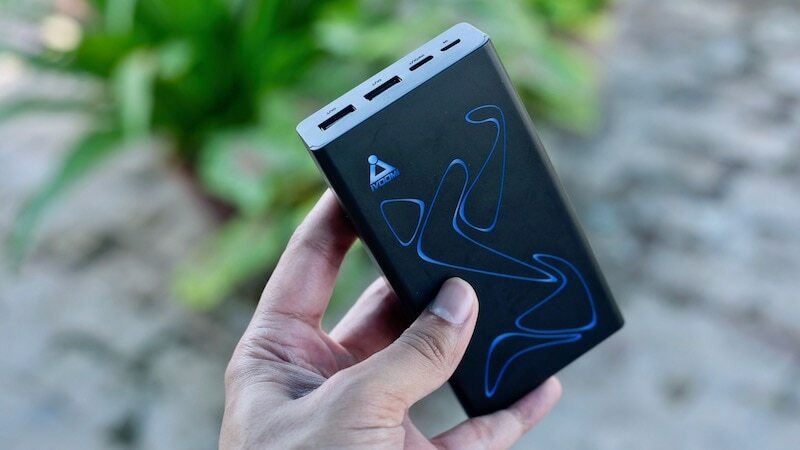 Ideally, though, if you are really looking for something to power your laptop, you should consider buying a power bank that’s capable of 24W or 30W Power Delivery, if not higher, as those power banks start to become more mainstream. When plugged in to either of the other two power banks, the MacBook Pro actually lost power — though the laptop did indicate it was plugged in — while running the benchmarks. While idle, the Lcare unit could only top up the laptop by 1 percent in 15 minutes, while the iVoomi managed a healthier 5 percent. The only way you can realistically expect these power banks to charge your MacBook Pro is when the laptop is switched off.